Deadline to comment on the Montauk Lighthouse Rock Revetment Project is two days away! Your original comments are needed by June 3rd. Please use these talking points below as a guide and create comments in your own words and email them to the address at the bottom of this post. Surfing Resources Not Protected – Three surfing areas could potentially be impacted by the project and nothing in the HSLRR nor in the original 2005 Study provides definitive evidence to the contrary. The importance of surfing in this area has gone up dramatically since the 2005 study. 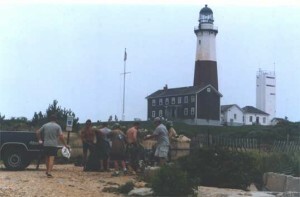 In 2006, 2007 and 2008, the surfing community fought the prohibition on surfing around the Lighthouse. We won when a judge declared that there is no rule prohibiting surfing around the Lighthouse. Still, insultingly, signs persist saying no surfing is allowed. Furthermore a Surfing Museum has opened at the Montauk Lighthouse complex underscoring the importance of surfing in this community. Therefore the surfing resources need to be evaluated as thoroughly as biological resources are for a project like this. East Hampton Coastal Legislation – Since the original study in 2005, the town of East Hampton passed coastal legislation in the form of the LWRP, the Local Waterfront Revitalization Program which essentially outlaws hard structures and armoring as responses to erosion. This project is contrary to what a democratically elected governing body passed with community support. While East Hampton may not have jurisdiction over the Lighthouse, the Lighthouse is in East Hampton, and the town has already declared that armoring is not the right response to erosion. Protect the structure not the bluff – The Hurricane Sandy LRR talks about protecting the bluff (p. i). While it is obvious that the lighthouse is on the bluff, the bluff would not need protecting if the lighthouse was moved. The main goal of the Corps should be providing the lighthouse complex with safe, long-term protection. The most long-lasting solution is moving the lighthouse. The bluff provides important ecological services to down-drift beaches. The Army Corps’ mindset of protecting a structure and the land it stands on from sea level rise is limiting and dangerous. The best protection comes from moving structures out of harms way. Contradictions – In a recent video on PBS Television’s NOVA program a man who has worked on the terracing of the bluff claims that, “We have not lost a wheelbarrow full of sediment off this project,” (since building the terrace and revetment.) Yet the Army Corps assessments from 2005 and 2016 both claim the revetment is “inadequate”, is degrading, and mentions the “progressive instability” of the bluff. Both of these things can’t be true. Moving Not Explored – The option of moving the Lighthouse was not revisited in the HSLRR. The Feasibility Study from 2005 said moving the Lighthouse would cost $27 Million (p.44) but there was no discussion of the future savings by not having to build, re-build, and maintain the rock revetment for hundreds of years. The whole purpose of the post-Sandy Reevaluation was to consider the increased risk form Sea Level Rise, and to evaluate the project for “long term sustainability” (p. 25). Clearly moving the lighthouse would be a longer-term and more sustainable solution than yet another rock revetment. Cost – The revised proposal will cost $18.2 million (p. iii) but the original estimate from 2005 was for $14.6 million (p. i) On page 8 of the HSLRR the original design was characterized as “difficult” because excavation 16 feet below mean low water was required. It mentions the “de-watering” which would “complicate” not to mention removing 32,000 cubic yards of material. The new design only excavates 2-3 feet below mean low water with removal of 4200 cubic yards of material. Also, less armor stone is called for in the current design. All this should add up to reduced cost, but somehow the cost is coming in millions higher than before. Economic Benefits Overstated – An economic assessment of the alternative of doing nothing makes the erroneous conclusion that the revetment would fail (immediately) and there would be no more lighthouse, museum or complex to attract people to the area. This is absurd. The lighthouse will stand for decades with or without a new rock revetment. The lighthouse complex will have visitors and people paying for parking for decades without this project. Therefore the economic analysis of doing nothing is flawed. In a federal budget of limited resources, this $18 Million could be better spent elsewhere in places that actually need protecting. Surfing Access – It is mentioned that during construction, fishing and surfing will be allowed on the beach next to the lighthouse, (p. 12). But only fishing organizations are mentioned as groups that will be consulted. Surfing groups like the Surfrider Foundation need to be reached out to regarding access during and after construction as equals with fishing organizations. Dangerous Precedent – If built, this rock revetment would send a message to every property owner on Eastern Long Island that the solution to naturally eroding bluff is a large pile of rocks at the base of the bluff. Not only is this anathema in a town that has taken a stand against hard structures, it would doom our local beaches. Armoring has been outlawed under East Hampton’s Local Waterfront Revitalization Plan, LWRP, based on the understanding that armoring on beaches causes them to disappear. Poor Public Process – Congress and the Army corps thought Hurricane Sandy was a significant enough event to require a reevaluation. We agree. But the public should therefore have to opportunity to be heard in light of information gained form Hurricane Sandy. There should be a longer public comment period, as well as public hearings in the community. There was no notice in the local papers about this project (?). The HSLRR stresses the importance of the Lighthouse complex to this community. They should therefore allow more time and a meaningful forum for people to digest, understand, and question the hundreds of new pages produced by this HSLRR and its appendices.